The electric bike that has it all — cruise Canadian beaches & streets in style while enjoying breathtaking performance and user-friendly features. The Interceptor is an ultra-comfortable bike designed for your riding pleasure. 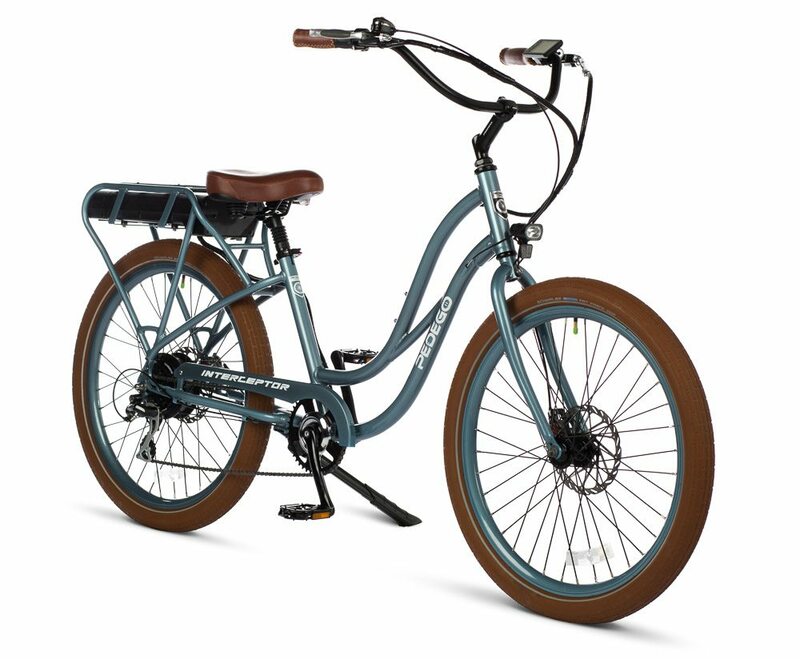 With its wide swept back handlebars and deluxe saddle, you’ll swear it was made just for you – because it was! The most important part of any Pedego is the person riding it, and the Interceptor makes YOU feel like a kid again. 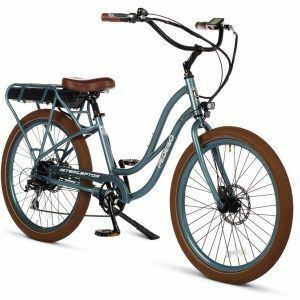 It is loaded with user-friendly features such as five levels of pedal assist for a more natural riding experience, a twist-and-go-throttle, front and rear lights for your safety, a USB port charger for your phone, and a Bluetooth connection to the battery. We’ve thought of it all. What really sets the Interceptor apart is its super-charged performance. It’s one of the most powerful electric bikes available in Canada, and the sensation of power it gives you while riding is exhilarating. 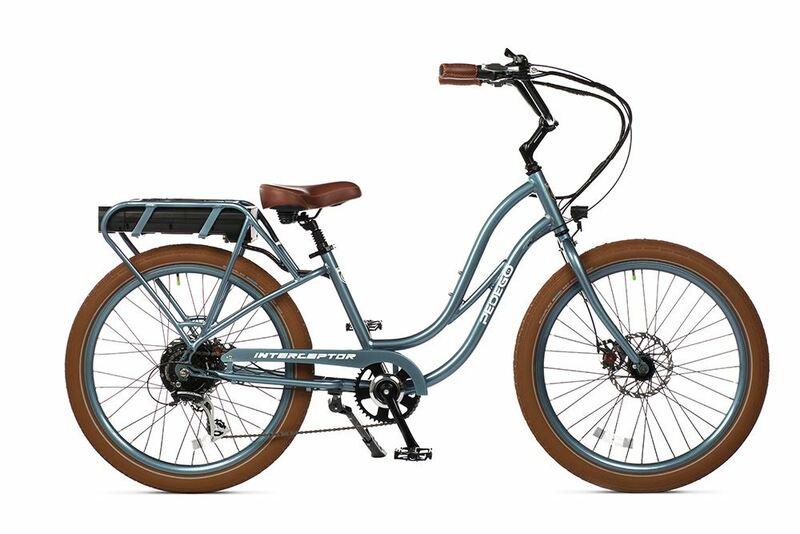 The 48 Volt battery is made of premium lithium-ion cells, mounted on the rear rack, and a few hours’ charge will take you up to 100 kilometres. The 500 watt motor is as a quiet as a dormouse and the sensation of power it adds to your ride is exhilarating. It eats up hills and headwinds. I am 55 years old and thought I would never ride a bike again. I have been told I need a knee replacement and I have been told I have Arthritis but no Doctor told me to get an electric bike and ride it everyday which is what I did and the only time my knee gives me problems anymore is when I go on vacation and don’t get to ride. As soon as I got home and started riding the pain and the clicking in my knee went away. I learned that when we don’t exercise our knees then we lose the muscles that support them. What is upsetting is that Doctors tell people they need knee replacements when really all they need is to have fun again on a Pedego! It does not matter which one you get because you will love anyone you get! Twenty years ago my wife and I bought the first generation (not Pedago) electic bikes. They were ok but not great in regards to charge or reliability. Last year at the ages of 70 and 65 we bought two Pedago Bikes from the McDowell Mountain store. I can say the knowlegable staff and the bikes themselves are a perfect 10 as far as reliabilty,handling and the amazing distances we can go on a charge. 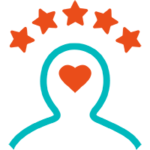 Shortly after our purchase I had a minor problem and called the store for advice and again we were blown away…within two hours they came to our home and made the adjustment on the spot…amazing! After purchase service has been first class, the bikes are incredible and would recommend the Bike and Pedago McDowell Mountain to all that are considering a wonderfull way to spend your time enjoying Arizona with the wind in your face. Upgraded to the new Interceptor. The pedal assist works great. No need to use the throttle which makes the ride more enjoyable. I love the speedometer, lights the extra power going up the hills. The people at pedego were a pleasure to deal with. The bike is high end quality all the way, everything works extra nice, the battery pack lasts an incredible long time before needing a charge, we have the 15 amp 48 volt, worth the extra money, as I have two other Ebike kits I put together and the battery packs run out much quicker, we have had it a couple years and zero problems. BEST Customer Service/Support I have ever experienced, bar none!! I Love my Interceptor and wanted to find some folks to ride with and discover new places to ride. I signed up for a cancer charity ride and three days before the event my twist shifter broke. I really wanted to make this ride as I had gotten sponsors to donate money as I was riding in honor of a friend who had lost their battle with cancer. I called Pedego and they overnited the parts to Pedego Blue Ridge in Georgia. Since the bike could not be fixed in time the good folks at Pedego Blue Ridge put me on a 24″ Interceptor just like mine for the upcoming ride. All went great on “The Silver Comet Trail” ride put on by Cycliad. I met some of the pro riders, raised alot of money and handed out tons of pedego info and cards as everyone wanted to try out my bike. I just purchased my 2nd Pedego. Bought a 26″ Interceptor in 2012. It has always been too big for me. Back in the day Pedego didn’t make a 24″ Interceptor. Decided to sell old bike and Purchased 24″ Interceptor and just love it. The new technology alone was worth the change. Love the pedal assist and the size is perfect for me. Thank you Pedego for all the fun. As a long time cycling enthusiast from Wisconsin, I transplanted to sunny Tucson, Arizona. I still tried to enjoy cycling, but with old injuries of broken bones, arthritis and at the age of 50, it became more like work. I began a search for alternative powered bicycles and in July of 2012, I owned my first Pedego Interceptor. Whether I’m using it for my 30 mile round trip commute or a lazy Saturday afternoon ride to the local watering hole, my Pedego has been there as a great alternative. As an owner now for over four years and nearly 20,000 miles, I’ve found the bike not only enjoyable to ride with the variable pedal assist levels, but easy to maintain, much like a standard bicycle I was most familiar with. 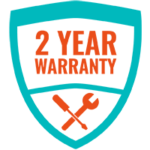 Pedego has been there every step of the way with great technical support, customer satisfaction or with my “Do it yourself” part replacement requests. I am 74 years old and since I got my PEDEGO 4 years ago it has re-invigorated my life. I have lost weight, taken away my knee pain and provided me with multiple new adventures. I have done the RAGBRAI ride across Iowa, ridden fron Saint Paul to Canada and in total I have ridden over 9000 miles. It has clearly given me new life! Outstanding bike - I recommend it without reservation! 1. Weight and bulk – this bike is more or less equivalent to driving a GMC Yukon. It lacks the agility of a light mountain bike, but is quite stable and comfortable to ride. There is a learning curve re controlling it but in a week, the owner will master it and be quite confident and proficient. a. Stamina enhancer – I am 73 and, although I’m in pretty good shape physically, I don’t have the sheer stamina that I used to; it is very nice when I’ve gone a long distance, i.e., 15-20 miles without assist, to know that I have the electric assist in reserve for the return trip, especially the twist throttle that allows me to ride without pedaling. b. Acceleration: due to the bike’s weight and bulk, it is sometimes difficult to get going from a stop, especially on an incline – in these situations, I find that the motor will give a much appreciated boost to get me up to speed when it would be very difficult without the assist. c. Motor can keep you out of trouble in “bunch-up” situations: I do most of my riding on a bike path on Cape Cod – in the summer, it is very congested and people have a habit of riding in packs, occupying most of width of the bike path, which can be very harrowing if you encounter them. In these situations, I simply engage the motor, sound the bell and glide past most of them in less than a minute, accompanied by looks of amazement and envy on their part. d. Ease of top speed adjustment: I found that my insurance carrier would not issue me liability insurance for the e-bike unless its top speed was 15 mph. As shipped from the factory, it has a nominal top speed of 20 mph. I found, when I called the factory, that the folks there were extremely helpful and told me how to access a potentiometer in the rear of the bike (extremely easy to do) and adjust its speed by turning a screw on the potentiometer. This was extremely important to me because I felt that the danger of liability if I happened to injure someone was imply too great to act as a self-insurer! This alone makes the e-bike the one of choice as far as I’m concerned. e. Battery charge longevity: I’ve never driven 30 miles on battery alone, but after 3-5 miles of assist, I’ve found that the charge still registers “full.” I think the Lithium ion battery is superb and am extremely happy with its capacity (I have the 48 ampere battery, which is standard with the Interceptor). As far as I’m concerned, the Pedigo is the best on the market and fairly priced. Their dealer network is expanding and I am confident that once the public “catches on” that we will see many more of them. We purchased our Interceptor’s among ago. We looked and test rode all models of e-bikes for over a month before test riding a pedego. We rode the Pedego’s and knew in the first 10 minutes these were the bikes we would buy. We have already ridden over 300 miles and are now planning trips where we can take our new bikes. We have been to San Barbara, San Diego, Santa Monica, Manhattan Beach, Huntington Beach, Carlsbad and Oceanside with our bikes. We love the staff at Pedego in Huntington Beach and Carlsbad. Always willing to help beyond the sale. HIGHLY RECOMMEND YOU CONSIDER A PEDEGO. She loves her orange Interceptor. My wife’s new Interceptor was delivered last Wednesday and I went right to work getting it ready to ride, which amounted mostly to carefully unpacking the hardware. I was amazed at how well the bike was packaged and protected. And, the assembly was as basic as it could possibly be. So far,….everything was “Cruzin” along just fine. Today, Sunday, August 17, 2014, we loaded our bikes onto the rack and headed for the Lake Country bike trail, located in Waukesha County, WI. This is the trail that my wife has not done in over a year because she no longer wants to deal with the long steep hills. Today she passed me up like a dirty shirt on those dreaded hills! And, she was smiling all the way to the top. This made my day, and hers. The Pedego Interceptor is the perfect choice for her. Plenty of power, quiet, sturdy, amazingly comfortable, easy to operate and loads of fun. Next week we’ll be in Peninsula State Park (WI) where there are even more hills and lots of great trails. I cringe to think I almost bought a different, inferior product, from a competing manufacturer. I rode the other product, so I can say with absolute certainty that she would never have been satisfied with their bike. But she loves her orange Interceptor. I have been biking for years and I want to encourage people in Indiana to visit Pedego Electric Bikes in Carmel. The owner, Josh, is terrific to work with, he has excellent products and he goes out of his way to be sure you are satisfied. We weren’t even in the market for electric bikes but we stopped in to check out the products. My wife and I were blown away with the fun and ended up buying two interceptors on the same day. We spent the next day on the Monon trail and had a fantastic day of biking. By the way, we are not being compensated for this review…it was just that good an experience. We just purchased two bikes, a step thru and an Interceptor, that are much more than advertised. Much better then the site implies. We are very very pleased. If you are considering one and are a man or just heavy get the Interceptor. The extra voltage makes a difference on long hills. I can use my wife’s just fine but I can accelerate more up a steep hill with the Interceptor. Love to be riding again! The hubby & I each just purchased the Interceptor cruisers and are very happy with the purchase. Pricey but Well worth the money. All I need now is my basket and cup holder 🙂 Great Service from Pedego as well!! Just got my Interceptor on Friday. I’ve taken it for two 20 miles rides so far. The bike works great just like the reviews. I did extensive research before purchasing. I like that it mostly looks like a regular bike. I was able to make both 20 mile rides with moderate hills without draining the battery. I pedaled quite a bit but the boost was great help on hills. I could easily stay with the road bikes when I wanted to. We bought two of the Interceptors about 6 months ago and could not be happier. The wife loves the step through. A good example is the new trail out of Moab Utah. Goes up from Moab past Arches park to Canyonlands park. Many people were dropping bikes off in Canyonlands and riding down hill…not us…started in Moab and went up hill, then coasted back down. Beautiful bike only bridge across river. You see so much more from a bike.. Don’t wait get yours today! My wife and I got two of the Interceptor Bikes and at 58 YOA I want to let you know they are a great investment in your health and the best bikes on the market. I’m 6’2″ 280 lbs and my Interceptor makes me feel like I’m 16 again. I had a problem with my feet and after a week of pedaling the problem was gone. I have been in law enforcement for 27 years and think it would be a great tool for our officers who need to get into tight spaces and chase people who break the law. A tiered Cop can’t catch anyone!! Thanks Pedego your not a five your a TEN!!! Great bikes and customer service. I purchased 2 Pedago ebikes in a two week period. Was so impressed with the Classic Cruiser, I came back and bought an Interceptor. for the price in the ebike world. Customer service-Great. Received a phone call from owner Terry within hours of placing my online order to set up delivery to my front door in 2 days. I called back to order the Interceptor and spoke with co-owner Don, who answered a couple of tech questions I had. Got the same quick and easy delivery. Ruby and Julie at Pedego Bikes, Qualicum Beach, BC have been excellent in sales and service. I’ve only had my bike (Interceptor) for two weeks and have done over 300 kms. The small town where I live is hilly and not ‘traditional bike’ friendly. I am now out most days discovering my community. The local stores are about 8 kms. 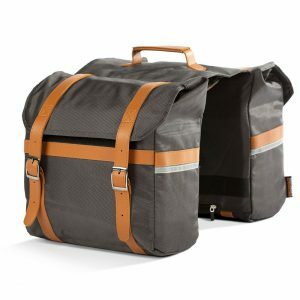 away – most trips I now make by bike – with a basket on front and panniers on the back, I can carry quite a bit. I get just as much exercise because I’m always pedalling but I certainly notice I am saving my knees from the stress and strain that a lot of biking can subject them to. By using both the manual gears and the pedal assist, I’m always in my comfort zone. I’m close to 70 years and the euphoria of the open road on a bike will be with me for a long time, I’m thinking. No regrets with this purchase for sure! Also, another plug for Julie and Ruby – I’m really impressed with your store, your spirit and your ‘happy customer’ philosophy. Fantastic Bike - I Love It!! I bought my Pedego Interceptor two months ago and have used it to commute to work every day (a 24 mile round trip) – not to mention riding out for fun or errands on weekends. The bike is fantastic, a sturdy build, lots of power, great looking. People constantly want to stop me and talk about it. Even people in cars driving alongside me. I can’t recommend this bicycle enough!! Greatest Electric Bike I have had. I have a Pedego Interceptor. This is my second Electric Bike. The first one brand “X”, I had for about 18 months and I sold it with 400 miles on it. Bought this Pedego 5/26/2011 and today I have recorded 2242.35 Miles on it. The biggest factor for me is they stand 100 behind their product. In fact I have enjoyed it so much, that two friends purchased the same model and we all love them. I’m retire and use it also for trips to the store. Great Bike with Great People standing behind the product. My wife and I, in our late 50’s/early60’s, purchased our bikes a bit over 1 year ago. I have a white Interceptor and my wife a red step-through cruiser. The product is terrific and amazingly fun to ride. I ride every weekend and have taken 20-30 mile cruises without getting close to needing a re-charge. I always pedal but never does my rear-end need to leave the seat. I cannot go anyway without people stopping to ask me questions about my cool looking bike. My one concern immediately upon receiving my bike last year was the kick-stand. Unlike the heavy duty and robust parts of the bike, the kickstand, from the beginning, seemed to be somewhat flimsy. Sure enough it finally broke down a few weeks ago. I wasn’t too upset as it didn’t seem like it would be expensive or difficult to replace. On a lark, I decided to contact Pedego to see if they could recommend a replacement for purchase. On a Sunday, Don quickly e-mailed back that they are sending a replacement at no charge and “sorry for the problems”. Wow! Talk about exceeding expectations! My bikes are out of warranty and they still stand behind the components. Pedego (and Don) were awesome and I would definately recommend their products and company. We only have 4 pedego's for our personal use that's all. We are the very proud owners of 4 Pedego’s all 48 volt batteries. I have 2 interceptors, 1 brand new interceptor with mag wheels, absolutely awesome, amazing bike. My wife has an interceptor and a brand new ridge rider. Almost 4 years ago we bought our first his and her interceptor bikes after doing a lot of research and hands down I was convinced that Pedego was the way to go. Almost every weekend you will find me or us at a campground up or down the coastline in So. Cal. in my RV, class A diesel pusher with a custom built carrier, rear hitch mounted for our Pedego’s. Weather it’s exercise, going to the market, going to the fairgrounds, riding the bike trails, one thing for sure is our bikes always get us wherever we want to go and parking is never a problem imagine that!! Pedego’s customer service and my dealership experiences have always been awesome. Thank you Pedego for being such a great company and proving happy fun to us and many others. I always brag how life is not complete unless you own a Pedego. I have been on two wheels for some 60 years either a bicycle or motorcycle. When I first got my Pedego Interceptor I was thrilled. While I was in Europe I tried some European bikes that were nice but nothing like my new Interceptor. You can ride it like a regular bike because it is lighter and more responsive also lower. This Pedego bike is easy to pedal with gears and no motor. You can also ride it with no hands because it is so responsive. I call my new interceptor a Ferrari of electric bikes. Just want to let you know how much I love the bike, thanks. Its one of the best purchases I've ever made! I bought the Interceptor, and this bike is amazing! I ride it everywhere. For the most part I can ride it all day long all around Huntington and Newport Beach and still have battery left for more. When looking at an Electric Bike there are all kinds of reasons to get one. I’ve used it for work so it’s become a complete tax write off for my business. 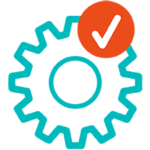 I’ve used it for pleasure and I’ve used to for advertisement and marketing so it helped generate leads and revenue for my business how cool is that? Its one of the best purchases I’ve ever made! If your in the market for an electric bike, before you do anything at all, swing by and see the guys at the HB Pedego Location and I’m sure you will be more then pleased with their awesome customer service, education and performance. Plus, these guys are two of the best Pedego mechanics they have in the entire organization. Be sure to call them and ask for a fun free test ride, that’s all it will take to get you hooked on the Pedego Electric Bike. I have been riding my black Pedego interceptor for the past three years. I have over 10,000 miles and have had the best experience with it. I commute to work, take the bike on joy rides and tow my surfboard to the beach. I love my bike so much, that I decided it was time for an uograde. So I just got a new fire engine red Pedego Interceptor at Electric Bikes LA in El Segundo. The bike has the bigger battery, the streamlined motor, pedal assist wirh an active throttle and rides great! I can’t wait to start my next 10000 miles.! Thanks so much to the Pedego team for making my life better! Hello fun . . . I just got my interceptor a week ago. I’ve been riding in some cool temperatures but I’m still having fun. I’ve just got 160 km on it (100 miles). I’m surprized at the quality of the bike and am impressed by the battery. I have been pulling a kid cart some of the time. Works great. It’s also a treat to hit the headwinds and the hills. I can’t say enough good things about it. I’m particularly pleased by Bike Universe who supplied the bike. Thanks Ted, Neil, Chelsey and Teale. Thanks for steering me away from motor add one to this great bike. P.S. I went back and bought one for my daughter too. I see lots and lots of bike rides in my future! My first ride on the Interceptor! We are so happy with the Interceptors. Rode about 16 miles this afternoon up and down the hills here in north Georgia. It is everything I dreamed of! I want to still “ride the bike” for exercise and yet not kill myself on the hills. We pretty much peddled for the most part using pedal assist when needed! I literally laughed out loud as I climbed some of the hills I’ve struggled on this past few years!!! I was cautious coming down a couple of the bigger hills at first, not knowing how it would handle, but was very pleasantly surprised on some other hills. On one I hit over 32 mph and it was just as smooth and straight as could be! The best part was the return back home. We have about 3/4 mile of uphill curvy road on loose gravel. I’ve had to push many a bike up this road, but no problems with the Interceptor! I see lots and lots of bike rides in my future! Best Purchase in a long time!!!!! I spent the last few “years” researching electric bikes. Spent a lot of time on the web, Amazon and other sites reading reviews and doing my research. Finally when I came across the Pedego brand I knew I found my bike. I purchased a Brushed Aluminum 26″ Interceptor with the 48V 15A battery. My bike arrived in about 7 business days. It was very simple to assemble. Handle bars and peddles were installed within 15 minutes. The battery was fully charged and the “how to use manual” was quick and simple to read. The bike changed the way I think about riding. I am in good shape and enjoy riding a regular bike but the Pedego changes everything. Hills are not even thought of anymore. The bike is super comfortable and well made. Riding in “throttle only mode” gives you the feel of riding a scooter or motor bike. The range with my 48V 15A battery has not been pushed to the limits but I love the power and expected range. I have to say that I am truly satisfied with my purchase and I am considering a City Commuter so that my son, wife or daughter can ride with me. Riding a Pedego is just plain fun! My husband and I purchased two Interceptors 3 ½ years ago. We could not be happier with these bikes. We live in the foothills of Southern California and these PEDEGO bikes instantaneously makes everything flat. No more “huffing and puffing” up those hills. We are able to take them on our bike rack which gives us the flexibility and adventures we were looking for, whether it is the beach, the wine country or city sightseeing. I’d like to give a “shout out” to Nick at their Irvine Facility. We needed a few adjustments to both bikes and he provided us with OUTSTANDING service. 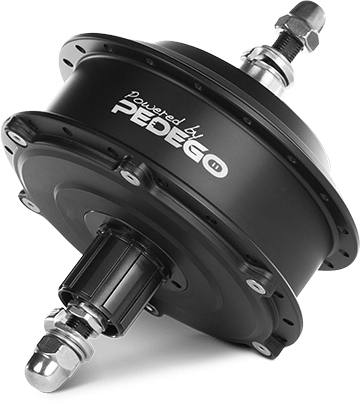 PEDEGO a company who stand behind their products, they have ‘live’ technical support and a commitment to excellence. You can buy with confidence, something that is hard to find in today’s market. Thanks again to PEDEGO for a fantastic product. Even Webster, our dachshund, loves his pedego bike. So much fun! My husband and I both of pedego bikes. We love them and don’t think we have had a good ride unless we go about 60 Kms. All we have to say to our dog is, do you want to go for a bike ride and he runs to the garage to get put into his carrier. If we bike without him, he howls the whole time we are gone! Every time I ride it I say. I love this bike! Very comfortable. You don’t weight bear on your wrists. Eady to handle. Love, Love, Love My Pedego! Love feeling like a kid again. Love that feeling of being free & not worrying about getting too tired. Pedal on my own power until I need a boost with the pedal assist. IT IS AWESOME! I waited for three years saving and dreaming for this bike. I never buy anything on credit but I wish I had bought this bike on credit so that I could have enjoyed it years earlier. Go ahead and buy it. You can test drive the models on a vacation and have it shipped right to yourself. I am not mechanically inclined but the assembly was easy. JUST DO IT. You won’t regret it. My Pedago is perfect for use in my neighborhood. As a retired educator, I was always trying to keep up with others who rode faster and longer. Now I can. I have ridden over 500 miles and am looking forward to many more. Pedago is a first class operation. Our salesman was knowledgeable, helpful and ready to assist with every aspect. I am looking forward to biking season to put on many more miles. I love to ride my bike, for one I can now join my friends who go longer distance so I am able to feel included and not be left out. Plus the exercise and feeling I get when I am finished riding gives me such a high. I feel incredible after a ride. I highly recommend these bikes, they are not cheater bikes and once you give one a try you will realize just how awesome they are. Yep, going uphill doesn’t phase me anymore. Also longer distances are easily obtainable. Since Pete (his Pedego is the Commuter) and I have gotten our Pedegos we now plan our vacation trailer trips with biking trails in mind. Gives us something to look for in our retirement wanderings. We will soon be moving into a retirement community and I’m even considering getting the Pedego trike instead of a golf cart! So nice to be over 70 and still able to keep up and enjoy the outdoors. This something I’ve been wanting for a long time and so glad it is now available! Thank You Pedego! Had my bike for one year. It’s been great. I am 58 and not into exercise. Before bike riding was more like work then fun. Now it’s just fun. I pedal but sometime I need some help. This electric bike has put me back on a bike after years of not riding. I am 79 years old and have been riding my Pedego for 12 months. I have covered 1430 miles with ease. It is so easy with Pedego power.I usually go for a 20-28 mile ride in 2 hours but shorter rides are also fun. Get off the couch and have some fun. I love this bike. I would get tired quickly keeping up with my husband. Now I can keep up and not be winded as we travel around.The stress is gone and I can participate more often. The Pedego design offers perfect synergy between bicycle and rider. The settings provide a precision ability to provide a “not-to-much, not-to-little” exercise experience. I have owned an risen my Pedego Interceptor for 1-1/2 years now with over 1400 miles. I became interested in an e bike after using public transportation for some time and noticing college students zipping by on just regular pedal bikes. I saw an ad from a Pedego dealer one was soon zipping the six miles to work in twenty minutes effortlessly! My normal commute was a very roundabout 1-1/2 hours each way vs the leasurely sight filled route where I always park in front! I am a 63 year old non-rider who would now not take my Pedego anywhere. I love riding my Pedego. It’s fun, it’s easy and I can go farther and faster than a pedal bike… and still get good exercise. I'm more active with my Pedego! With my Pedego Interceptor I am not afraid to try longer and more hilly trips. It has opened up a whole new range of rides for me! My husband and I now do biking vacations, soemthign we never would have considered before. I LOVE MY PEDEGO! Also, we have the BEST Pedego support from Sue & Kenny at Pedego, Redondo Beach, CA!! They’re the best! As a 60-something woman who has been riding bikes for 15 years, I can say that my new Pedego Interceptor is a game-changer! I no longer have to worry about keeping up with my husband on the crazy rides he plans for us…I can go ANYWHERE! I can chose to ride with no motor assist on comfortable trails, or add the pedal assist when I’m tired, riding up a long hill, or riding into the wind. And the throttle allows me to power through a dangerous intersection or up a very steep path. I am loving being empowered!!! As an active mother of 4 who always enjoyed biking with my family, it was devastating when failed ACL knee surgery left me unable to ride a bike. Everything changed when my husband found Pedego and surprised me for my birthday. I can now rejoin my family on the biking outings I love so much. I cannot express enough how much I appreciate what Pededo has meant to me. The Pedal Assist and Step Through has made it able for me to ride again after my Stroke suffered two years ago. I still can’t control most of my left side due to nerve issues, but being out and active has helped me not just physically, but my mental health being out enjoying the fresh air and outdoors. Hi lives in San Francisco would like to get one because of the hills there! We love our Pedego’s!! My husband and I retired recently. He is an avid road bike rider. He rides several hours each day when weather permits. I am not nearly as fit or dedicated as he is so I had missed out on the bike rides. Now my Pedego electric bike allows me to comfortably ride with him and be a part of his cycling routine. Living happily ever after with my Pedego! My daughter bought one first. She raved about it so I went with her to pick hers up after adding some mods. While waiting I was looking at all the different bikes and talking to the shop’s owner. He offered to rent me 1 and if I decided to buy, would use the rental fee as partial payment. We agreed and I had it with my daughter for just over an hour. I didn’t get it that day but we went back the next weekend and I rented another 1. We had such a good time, I went home with my own. Took the bike back the next week to have to pre agreed additions installed. After completion the shop even delivered the bike to my house free. I ride it often, peddle most of the time with the assist set on 3. The bike could use a little more torque but its still so fun, even for me (my other bike is a Harley). Bought mine for a great price at the Corona Del Mar store. Good people there. Some people have a misconception that the Pedego is a lazy way to ride a bike. Just the opposite. It had helped me be more active. When camping, I go places that I would not even try to go. Instead of driving we ride our bikes EVERYWHERE. I am 60 yrs old now and my Pedego gives me the freedom to go wherever I want. You are in control from needing no help peddling to major climbs with assistance. With anything new it takes practice getting to know how your bike works. The adventure is endless. Go to a dealer and try them out. They will assist in finding the right size and model for you. Pedego is the best do not waste your time buying an off brand. They have fantastic customer service which means a lot. I wanted an electric bike to commute to work about 4 miles away. Test riding Pedego was so much fun I did it twice once to think about it and the second time just because. Since purchasing my bike, I have lost about 20 pounds, sold my car, and have used the bike exclusively as my means of local transportation. It’s changed me, my day to day, and my carbon footprint! When we travel to Minnesota or around our home state of North Dakota, we always take our Pedego E bikes with us. I had my Pedego Interceptor for only 90 days before my wife wanted one of her own. She got the City Commuter which fits her perfectly. So now when we travel anywhere we take the bikes with us because we love the classiness power of Pedego bikes. They are the Rolls-Royce of E bikes! At 79 this bike has extended why Horizons at the time when they were beginning to shrink. I use it primarily doing field research on back roads dirt roads and trails. It has an amazing capability combination of smooth running, comfort, and the capability of a mountain bike. It is very well-made and beautiful in its dark metallic green. I love being outdoors again three to four times per week. I have had many traditional bikes in the past that I would use on a sporadic basis when the weather was a perfect 10.I started to consider a bike that would offer a little assistance when the wind was blowing against me and the pedaling was twice as hard.I looked at many styles available online and in stores,which is how I ended up with Pedigo.I realized that they are not all the same.Body parts are heavier and welded nicely together.The brakes and shifter are smooth.The biggest difference I like was the integration of the battery to the bike.You can hardly tell there is a battery when you add a rear bag,plus the 48-15 battery power is amazing considering my 6ft 4 inch frame compared to what is available on less expensive bikes.I did not only shop price but I shopped quality which equals VALUE.It has changed my exercise ritual.Thank you Pedigo. I have owned my Pedego Interceptor since 2014. I ride two days per week with my biker buddies from home to the beach,breakfast and back. I live in North County coastal San Diego. Steep hills are a challenge and prior to purchasing the Pedego, I would have to walk my “”conventional”” bike up steep hills. The Pedego allows a 70 year old to ride those steep hills, physically pedaling up the lesser hills and trail 90% of the time. I currently have 5,350 miles on my Pedego Interceptor. One of the most important reasons I chose Pedego is the local service nearby.